Today, I welcome to my blogsite Barbara Ashford, one of my friends from the SFNovelists online group. Barbara has a new book out his month. 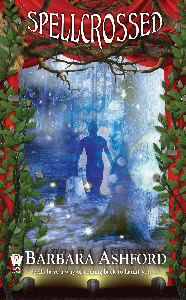 Spellcrossed is the second novel in her Crossroads Theater series. She and I have found that we have far more in common than we ever imagined, including a love of historical research and a passion for writing fantasy. Please welcome her. On the surface, David and I don’t seem to have a lot in common. He lives in Tennessee. I live outside New York City. He listens to jazz and bluegrass. I sing show tunes. He writes epic fantasy. I write…well, people are still trying to decide exactly how to categorize Spellcast and Spellcrossed. They have fantasy, mystery, a paranormal romance. They’re about people trying to find their paths in life. The families we’re given and the families we find. The bonds of community. And musical theatre. Yes, I’m a double dose of geekiness – a lover of musical theatre and fantasy. Writing the Crossroads Theatre series allowed me to play in both worlds and draw on my years as an actress to create a fantasy set in a magical summer stock theatre. To my surprise, another of my passions came into play while writing Spellcast: a passion for history that David and I share. Spellcast and Spellcrossed are structured like a musical with an overture, a finale, and entr’actes separating the three acts. While the main narrative belongs to Maggie Graham, a young woman trying to get her life in order, the entr’actes showcase Rowan Mackenzie, the theatre director with uncanny powers and a mysterious past. Originally, I wanted to use snippets from Rowan’s autobiographical musical as the entr’actes in Spellcast. I got so excited about the idea that instead of just writing the snippets, I started writing the show itself. Since it took place over the course of a century, I quickly realized I needed to do some research on American history in general and Vermont history in particular. How did farming change during the nineteenth century? What financial upheavals would have impelled the characters to leave the family farm? To sell the timber rights to their land? What songs were popular during the American Revolution? The Civil War? Which Vermont regiments fought at Gettysburg? When was the first edition of the McGuffey Reader published? What books would this farm family read? Which ones would give Rowan a view of the world beyond the few acres to which he was bound by a curse? I spent happy hours discovering the answers and working that information into the scenes that would chart Rowan’s emotional growth. I built his first friendships, his first grudging steps into the rural Vermont community. I laid the foundations for what would eventually become the Crossroads Theatre. And I wrote the entire show in three days. It was a wild and exhilarating ride. By the end, I had a one-act musical that could stand on its own. But when I used one of those scenes as the first entr’acte in Spellcast, my editor and I agreed that the shift from narrative to play script was just too jarring. So I fell back on the convention of journal entries to give readers insight into Rowan’s past and his feelings for Maggie. Disappointing? A little. But I don’t consider it wasted time. Whether or not the play is ever published or performed, writing By Iron Bound helped me dig deeper into Rowan’s character and the events that shaped his life. It recharged my creativity to write in a different art form. And it gave me the opportunity to combine all of my loves in one project. Hard to beat that. One final piece of history. After I sent this post to David, we discovered that we have something else in common: he grew up in the same Westchester County town that I lived in during the early years of my marriage. Truth is stranger than fiction. Thanks for playing host today, David. Now turn on some music and write! Visit www.barbara-ashford.com to learn more about the world of the Crossroads Theatre and find out how to win a free copy of Spellcast or Spellcrossed.